BetVictor has launched a Cash Out functionality for its sports betting offering and now punters have the opportunity to withdraw an active wager before the end of a match! BetVictor is already one of our most recommended bookmakers and their sportsbook is improving on a daily basis! The offering follows last month’s launch of the new version of their iOS App (4.0) into Apple’s App store. 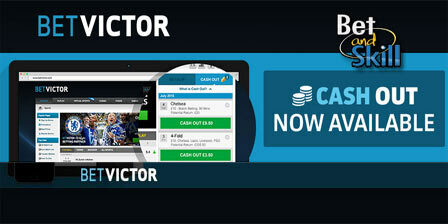 Betvictor has also been named the official global betting and gaming partner of Premier League champions Chelsea FC. Betfair was the first to launch the feature back in February 2011 and since then Cash Out has become a popular feature across a number of betting sites, with leading operators such as bet365, SkyBet and Ladbrokes having aready launched it for their punters. Cash Out option gives punters the opportunity to withdraw an active wager before it has drawn to its conclusion. This can be utilised to consolidate losses and profits. Correct Score - Extra Time. "Bet Victor launch the new Cash Out feature. Withdraw your profits before the end of the match"